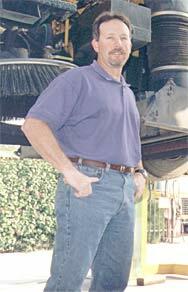 In recognition of his many contributions to the sweeping industry, Mark Carter, co-owner of Los Angeles-based Bill's Sweeping, has been selected as the American Sweeper Award of Excellence winner for 1999. In the words of well known retired contractor, Tom Ostuni, "Mark Carter is someone who's always willing to help out when someone needs it. He's one of those rare individuals who thinks big, and that's true for how he runs his own business as well as for the insight he's willing to provide others in the industry." Bill's Sweeping was started in 1953, was sold sometime later, and then was sold again to Bob Carter, Mark's father, in 1962. "No one named 'Bill' has been associated with our company since the 1950s," said Mark, who now shares ownership of the firm with his brother Mike. "There really hasn't been a convenient time to change the name, though, so we never have. We still get calls from contractors who have been out of the construction industry for awhile, sometimes for as much as 10 years or more. When they get back into the business, they give us a call because they recognize us as a familiar name." Bob Carter, and his wife Deanna, have been at least semiretired for the past 7 years. "They still come back in the winter, but the rest of the time they can be found at a camping resort they own in northern California," Mark said. "It's their 'little piece of heaven,' a hundred acres on a private lake. They built a log cabin for themselves, and stay there until the area snows in. When the snow melts, they head back up to the lake. Dad still keeps his hand in at the sweeping business when he's in town, though, especially when it comes to the equipment." The Carters have been involved with the national organization for sweeping, now called Contract Sweepers Institute (CSI), since it first got started in the mid 1980s. "My Dad went to either their first or second convention, and then I went with him the next year," said Mark. "I've been going ever since. I have yet to go to any of the conventions where I haven't more than paid for my trip with the information I gained. It always amazes me when contractors say they can't afford to travel to the conventions. I believe you can't afford not to travel to those types of events. Ongoing education is a key to success, as are the friends you gain in the industry. Some of my best friends are people in the sweeping industry who live in other parts of the country. "It's great when you travel on vacations, too. It seems like no matter where we go, we always have a place to stay. We've done that, too, stayed with other families we know in the industry, and they've done the same with us when they were out this way. The long-term friendships I've gained have been pretty amazing. "It's not everywhere you can go where the people have had the same headaches and heartaches and frustrations that you've had. There's a lot of common ground. We buy and sell parts back and forth, scrap a machine out that somebody else wants to get rid of, tell each other about new suppliers and so forth. You just can't afford not to be a part of that kind of network." Gabriel Vitale, our first Award of Excellence In Sweeping winner, is a past president of CSI and operates New Jersey-based C & L Sweeper Service. "Mark Carter was one of the first people I met when we initially put together a sweeper association," said Vitale. "I think it was at our 1988 meeting. Since then, I've considered Mark to be a great ally, not only for the industry in general but in my own sweeping business as well. Mark is a great person to run ideas back and forth with. Each year, we meet at the shows and make goals for each other. Each of us tells the other what we want to achieve in the next year, and then we each hold the other accountable for our progress the next time we meet. We've also both been at each others homes, and you couldn't ask to meet a better all around person anywhere." "In all of California there are hundreds and hundreds of sweeping contractors, yet less than half a dozen belong to CSI or go to the shows. In one sense, that provides us with a competitive advantage. On the other hand, it's sad, since they just don't know what they're missing and the sweeping industry doesn't have as much national clout as we should. If more of us were involved around the country, we'd be able to accomplish more." Bill's Sweeping has been at the same site during the duration of the Carter's ownership. A few years after his Dad purchased the company, Mark said, the family moved into a house that was on the property. "Where the equipment is now parked used to be our baseball diamond," he reminisced, "and we walked to school down the street. For years, we were surrounded by a chicken ranch. That changed to a truck stop, and now there are condos all around us. We're one of the last businesses in this part of town, but we're pretty good neighbors, so our plan is to stay here until we get a better offer." The Carters' company is unique, in that they do no nighttime sweeping, and very little street sweeping. "We concentrate pretty much entirely on construction sweeping," said Mark. "We run Elgins, Mobils and Tymco 600s, a Green Machine and a MadVac. We also run water trucks. That mix allows us to do some amount of specialty work, too." Although a number of California sweeping companies are larger than Bill's Sweeping, few, if any, can match the Carters in their professional methods and widely recognized ability. "Factors for our success? Well, we stick to our niches, and we're definitely not the cheapest around, which is a huge factor in being successful. Many times, customers and prospects have provided me with proposals that show what others are charging. I see some that are portrayed as a monthly price, and the amount is what, for us, would be a per sweeper weekly price. You kind of have to laugh at someone who's out there slowly sweeping their company and themselves dry." Will there be a third generation of Carters taking over at Bill's in the foreseeable future? "They're just entering high school, so it's too early to call that one," said Mark. "At 14, they haven't even entered the phase yet where they're 16 and can drive a sweeper. It's at that point that most owner's kids learn quickly that they definitely want to go on to college, or that they absolutely want to get as far away from sweeping as they can. "Our ongoing challenge is transmitting our knowledge to those who work for us. Both Mike and I have over 10,000 hours as sweeper operators. We certainly know how to do it, but we keep working on coming up with the best ways to transmit it to our employees. We try to keep them from having to learn everything by experience, but rather help them to learn through the wisdom we can bring them. It's much better to learn from other peoples' mistakes, rather than all of them having to go through it all on their own. "One thing we do that has really paid off for us, in terms of the niche we've carved out, is that we pay all of our small suppliers in the same week as we get their bill. For example, the people we get our fuel, parts and tires from. We don't worry about doing that with the phone bill or electric bill, however. For them, who cares? They get paid on their normal terms, net 30 or whatever. It's amazing, though, what has come back to us by paying all the small guys in the same week. First of all, you're flagged as an extraordinary account. They probably have 300 to 400 customers, and chances are we're the only ones doing that. Everyone else among the good customers are paying in 30 days, and the average accounts are paying in 45 to 60 days. When we pay within 10, it really makes us stand out in a positive way. What we have been able to accomplish as a result of that is phenomenal. The goodwill we've generated is far more valuable than whatever might be gained by holding onto their money another several weeks. Our fuel supplier has us first on their list, and the same with our parts supplier in terms of delivery and they don't even deliver to others! It also adds a lot of credibility to our organization, any time there is a discrepancy of some kind. Our word is as good as gold. We buy from many of the same places as other sweeping contractors, and we've learned that companies in our industry don't generally have a great reputation when it comes to that sort of thing. That makes us stand out even more." To reach Mark Carter, send email to: mnc@streetsweeper.com. This article is reprinted from American Sweeper magazine, Volume 7 Number 1, 1999.